As reported in the New York Times a New York State Judge has ruled that the upstate town of Dryden in Tompkins County can ban natural gas drilling within it’s boundaries. Passed last year to clarify that Dryden’s zoning prohibits the exploration for and production or storage of natural gas and petroleum, the home rule effort landed the Town of Dryden and the Town of Dryden Planning Board in a law suit brought by Denver-based Anschutz Exploration Corporation, which owns leases on more than 22,000 acres in the town and has invested $5.1 million in drilling operations there. Anschutz argued that the zoning amendments amounted to an attempt by the Town of Dryden to regulate the gas industry, but the Court found that New York state’s oil and gas law does not restrict municipalities from changing their own zoning laws to halt natural gas activities. While Anschutz may pursue appeals and other legal maneuvers to try to reassert its claims, the ruling is a decisive victory for opponents of fracking and advocates of home rule approaches to prevent fracking and related activities by concerned communities. “The town of Dryden has proven in court that citizens — and not multinational energy companies — control the future of their towns,” said Wes Gillingham of Catskill Mountainkeeper. Under the leadership of Helen and David Slottje, Earthjustice and Dryden Resources Awareness Coalition, environmental groups including Catskill Mountainkeeper came to the defense of Dryden and another NY town, Middlefield, when their newly enacted bans on gas drilling activities were challenged at the end of last year. Catskill Mountainkeeper and others have also been pursuing legislative efforts to strengthen the rights of communities to exclude gas drilling through zoning amendments, aquifer protection laws and other home rule activities. This week’s ruling validates New York’s existing home rule law and makes a strong statement endorsing the community efforts already underway across most of New York to enact laws to protect people, animals, farmlands, and existing ways of life from unwanted industrial activities such as gas drilling. 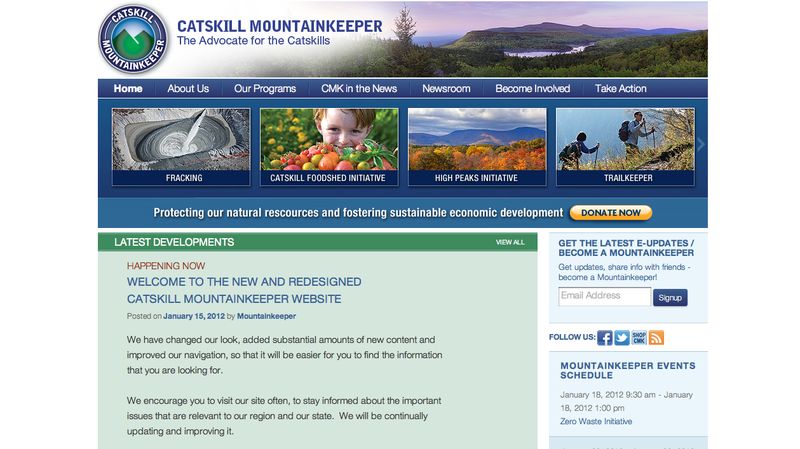 Presenting the New Catskill Mountainkeeper Website! Communicating with you is a critical part of our core mission and to satisfy our goal to keep you informed and educated about the issues that are important to the Catskills, we are proud to introduce our new revised and redesigned website. We have changed our look, added substantial amounts of new content and improved our navigation so that it will be easier for you to find the information you’re looking for. Under the leadership of Catskill Mountainkeeper Board Member, Ilene Ferber, we are happy to announce our launch. Here is a snapshot of the site. We have incorporated many of your great suggestions and we encourage you to visit our site often as we will be continually updating and improving it. Please tell your friends about it and encourage them to get involved. We’d love to hear from you and have added a “Contact Us” section on each page for your convenience. Please consider donating to Catskill Mountainkeeper so that we can continue to represent and work for you. All of our programs and initiatives, including this website, require a tremendous amount of staff time and cost. Catskill Mountainkeeper is a 501(c)(3) corporation and we are 100% reliant upon financial contributions to do our work. All of the money that we receive goes to pay for our program costs. Catskill Mountainkeeper is an independent, not for profit, 501(c)(3) community based environmental advocacy organization, dedicated to creating a flourishing sustainable economy in the Catskills and preserving and protecting the area’s long term health. We address issues of water integrity for the Delaware and Susquehanna River Systems, the defense of the vast woodlands that encompass the Catskill Forest Preserve and the New York City Watershed as well as farmland protection. We promote “smart” development that balances the economic needs and concerns of the Catskill regions’ citizens and the protection of our abundant but exceedingly vulnerable natural resources.